It’s no secret: Kids who enjoy reading tend to experience academic and professional success. According to a long-term study conducted by the University of Oxford, kids who read for pleasure had a much higher chance of achieving a professional position as adults than non-book lovers. In fact, multiple studies conducted from the 1970s to today indicate that students that engage in programs that promote reading, such as summer reading programs, result in higher vocabulary scores and a narrowing achievement gap – even across socio-economic lines. So how do you promote reading to your middle schoolers – and, more importantly, teach them to love reading? By choosing books that they love so much, they’ll ask for more. Finding great books that appeal to a middle-school-age audience is easy. Groups like Reading is Fundamental, Guys Read, GoodReads, the New York Public Library and the Young Adult Library Association offer lists of librarian-, educator-, author- and/or parent-recommended titles, as well as banned books for free-thinkers. From award-winners to best sellers, the best books for middle schoolers engage kids, spark their creativity and foster a love of reading. You can help promote reading by taking field trips to the library, bringing books along on errands and talking to your kids about what they’re reading. 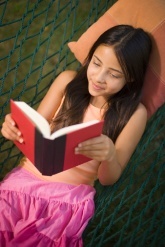 And don’t forget to be a reading role model; when your kids see you enjoying a good book, they’ll want to do it, too!